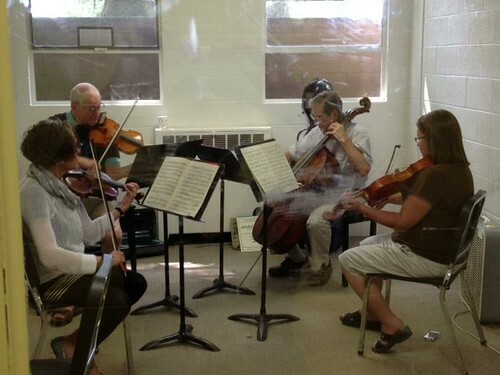 Interlochen, Aug 2013 - Adult Chamber Music Camp. It couldn't have come at a better time. Temperatures were soaring in Houston and I was out in it working harder than I had in years. When I stepped off the plane in Traverse City, the high temps were lower than Houston's low temps. That is when I knew my vacation truly started. This year, a returning v.com camper Elise Stanley and new v.com camper Carol Deaville, and returning camper Leah Lax, the cellist I play music with down here in H-town, got together before registration even started and played through Haydn's "Sunrise". What a wonderful way of starting off the camp week! Connecting with old friends and meeting new ones. The week continued with organized and "disorganized" ensembles lasting from sun-up to well past Sunset! Some memorable pieces were Dvorak's Op. 51, Beethoven's Grosse Fugue (3 times in one sitting! ), Schosty quartet #8, Hindemith duet for viola & cello, Mendelssohn's Octet, York Bowen's viola Sonata and Fantasy Quartet for 4 violas and Peter Schickele's Quartet in C-Minus. The viola quartet was one that a few of us arranged a month or so prior to camp, but never played before by three of us. 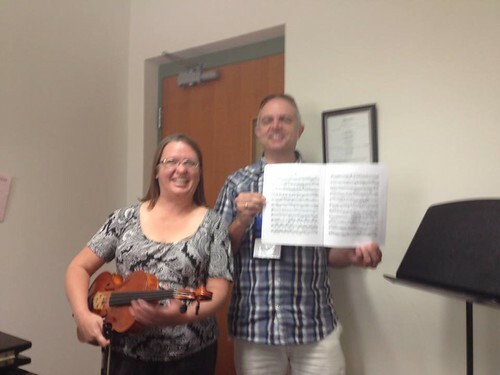 Somehow, I got nominated to play the 1st viola part. The first page didn't seem so bad. But once I looked at page 2 and beyond I nearly dropped dead in my tracks. This was a part that should be played on violin to avoid serious injury, and I had 3 days (30 minutes each day) to learn it as best I could. The group I played with was amazing and forgave me for stumbling a bit up in the nosebleed section. We plan on working it on our own over the next year for a master's class next year. The Schickele was a hoot and surprisingly difficult to pull off. Firstly, the way it is written one must question if everyone was playing horribly out of tune or not, or counting correctly or not, only to realize that yes, it is supposed to sound that way - horrible. Then there were the interruptions - not from someone getting lost, but for someone realizing what tune they were playing and laughing so hard they had to stop playing for fear of either dropping their instrument, or tears coming from their eyes from laughing so hard and no longer being able to read the music any longer. 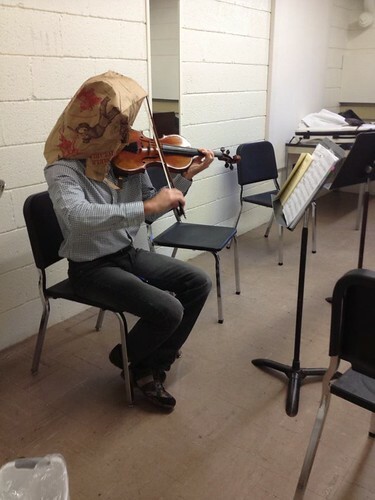 There were many people who peeked into the practice room window to see who was playing so horribly and stood to listen and laugh when they recognized a tune every so often. We are seriously considering this piece for a master's class as well. There is an art to playing so horribly on purpose. Apparently, we weren't the only ones embarrassed by our shenanigans. The next day, this was spotted in the practice room across from me. He is only known as "Trader Joe". The week wrapped up with a coached session with my previous teacher on the York Bowen Sonata I'd worked on for several months with my current teacher. I got some great pointers and had earned a happily surprised raised eyebrow or two. I look forward to next year for more musical mayhem!